Weekends are perfect for having fun and getting things done. That's why we put together this roundup of simple decorating projects that are no sweat to create. What's so great about these ideas? Everything. They make adding stylish function to your home fun and easy. In fact, you can DIY any one of these 13 IKEA hacks in a day or less. At $35, you can't beat the price. Its compact size (it's only 12-inches deep!) makes it a handy storage solution for tiny narrow rooms and hallways. It is perfect for hacking. The RAST's untreated solid wood surface begs to be painted, stained, you name it. Several coats of paint and stain transformed this hardworking piece of furniture seen on IKEA Hackers into a rare beauty. The frosting on the cake is the gold drawer pulls. Sweet dreams may have conjured this space-making idea spotted on IKEA Ideas. The project uses inexpensive shoe cabinets to create a headboard with storage. To make you'll need six IKEA TRONES cabinets. A pack of three costs around $40. Next, you'll use a power drill and the enclosed mounting hardware to install the TRONES onto a wall. To brighten things up, wrap with LED strip lights like these from IKEA's DIODER series. The IKEA VALJE wall cabinet series features practical pieces perfect for displaying books and small objects. Greek designer, Georgia Kalt came up with a leggy hack that turns a couple of VALJE cubbies into a table unit. Two VALJE cabinets. One with a door and one without a door. Four IKEA HILVER furniture legs. To attach the two cubbies use wood glue. For the best results, use clamps to secure the cubbies together while the glue sets overnight. After you drill holes for the screws that came with legs, attach them. Many moons ago, Ashley Rose from Sugar and Cloth purchased an IKEA TULLSTA chair. While it held up well over the years, she decided it was time to refresh the seat with an 80s inspired print. Her project uses paint to create the eye-catching design, which virtually anyone with a little patience can do too in a couple of hours. Foam paintbrush for creating the "swooshes." The one she used is 1-inch wide. Foam pouncer with a flat head for creating dots. The one she used is 1-inch round, which is roughly the size of a quarter. Lots of cities have bike-sharing programs. But to be honest, getting around town on a clumsy rental is not much fun. While it would be great to have your own set of wheels, you don't want to park it in your living room. That's why we heart this IKEA HJÄLMAREN hack by IKEA Hackers. It transforms the two-hook towel rack into a sleek, bike hanging system. If you prefer to thumb through magazines instead of swiping their pages left or right, this VARIERA Box hack by Leg Heads will keep your glossies organized. One VARIERA Box with a handle. One set of furniture legs. Every good kitty deserves a cat cave, right? Skels, a self-confessed crafter, was inspired to build this feline hideaway after seeing something similar on Etsy for a whopping $100. If you have a KALLAX shelving system, congrats, you're nearly done! If not, you can buy one for around $64.00. You'll also need a box designed to fit snugly inside a Kallax cubby like the IKEA TJENA or IKEA DRÖNA. Skels went with the latter. It costs around $5. Next, use a bowl to outline a cat-sized opening on one side of the box. Afterward, cut out the opening using the ingenious method shared by Skels on Click Click Snap Snap. You want to let the sunshine in without sacrificing your indoor privacy. No problem. This DIY by IKEA Ideas shares how to hack a curtain for the lower half of your window using a clean kitchen towel. The IKEA KNAGGLIG is a stackable, pine crate perfect for storing pretty much anything in your home. Unfortunately, linking them securely side by side usually requires a power tool or two, until now. This tutorial found on Thingiverse shares how you could quickly create a plastic assembly clip specifically for this IKEA crate using a three a 3-D printer. Anna Dorbyk thought her IKEA PS 2014 Rug was too lovely to walk on. So she decided to turn it into a wall tapestry. You'll find her tutorial at IKEA Hackers. To do, she attached two pieces of finished, maple wood roughly 3-inches wide and 54-inches long. First, she secured one piece of wood to the wall using 2-1/2″ screws. Next, she secured the rug in between both pieces of wood by fastening all three items together using 1-1/2″ screws. Afterward, wood caps were added to hide the screw heads. 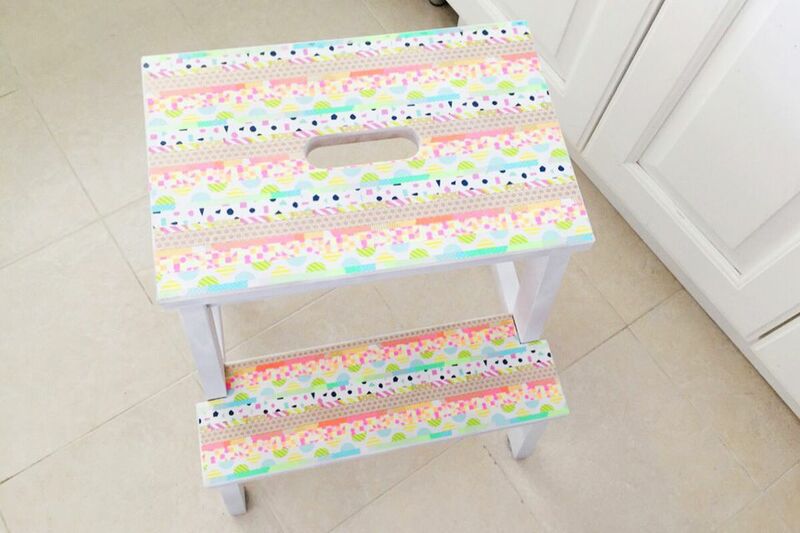 If you love to doodle, you can makeover any hardwood IKEA item using a permanent marker. For instance, pieces like the BEKVAM step stool featured on Livet Hemma, work best because the wood is unfinished. Got five minutes? Then you have more than enough time to create this chic and unique IKEA KRUSNING hack spotted on IKEA Ideas. One KRUSNING pendant lamp. It only costs around $10. A lampstand (without a shade). First, flip the KRUSNING upside down. Next, fit it on top of the lampstand. Congratulations, you're done — unless you want to secure the pendant's cord to the stand using a couple of small cable ties. IKEA's BEKVAM step stool may be a plain Jane, but it's also a hardworking piece of furniture that helps countless people reach that awkward cabinet over the fridge. So isn't it time we pay respect to the humble BEKVAM? Estelle, the crafting aficionado behind Petit Bout de Chou, says, "Yass!" First, she painted it white using spray paint. FYI, chalk paint applied with a brush will also get the job done but without the mess or smell. Afterward, she covered the steps with colorful strips of washi tape. Next, she applied several coats of Mod Podge, a decoupage glue, to seal and protect the surface.